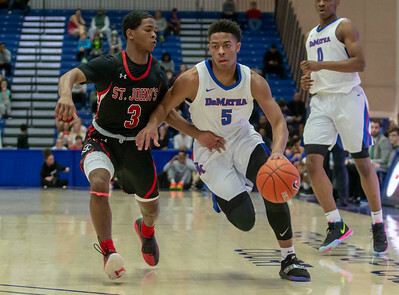 St. John's defeated DeMatha Catholic High School, 53-52, on Feb. 24 in the WCAC boys Basketball Tournament semifinals. Photo by Michael Smith/The Prince George's Sentinel. 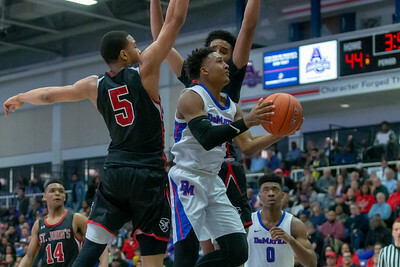 Washington, DC, Sunday, February 24, 2019: Justin Moore (5) of DeMatha tries to get past John Wilson(3) during a WCAC Boy's Semi-Final tournament game between St. John's and DeMatha held at Bender Arena in Washington, DC. (Michael R. Smith/The Prince George's Sentinel). 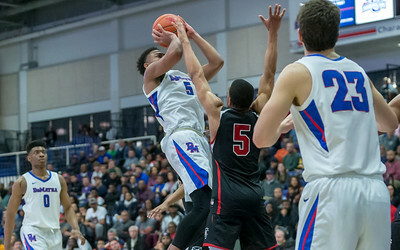 Washington, DC, Sunday, February 24, 2019: Justin Moore (5) shoots over the outstretched hand of Ishmael Leggett (5) during a WCAC Boy's Semi-Final tournament game between St. John's and DeMatha held at Bender Arena in Washington, DC. (Michael R. Smith/The Prince George's Sentinel). 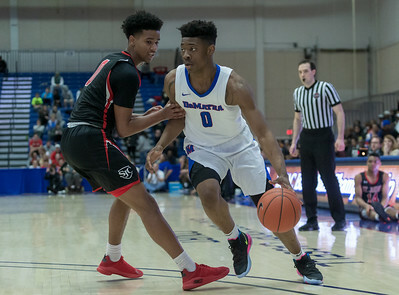 Washington, DC, Sunday, February 24, 2019: Earl Timberlake (0) of DeMatha drives around Jalin Abbott (0) during a WCAC Boy's Semi-Final tournament game between St. John's and DeMatha held at Bender Arena in Washington, DC. (Michael R. Smith/The Prince George's Sentinel). Washington, DC, Sunday, February 24, 2019: Earl Timberlake (0) of DeMatha lays the ball up during a WCAC Boy's Semi-Final tournament game between St. John's and DeMatha held at Bender Arena in Washington, DC. (Michael R. Smith/The Prince George's Sentinel). 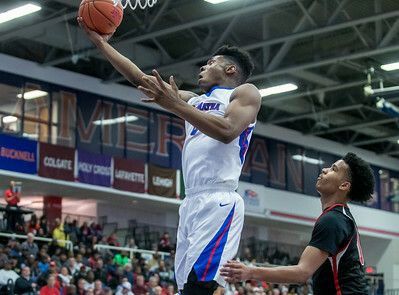 Washington, DC, Sunday, February 24, 2019: Jamir Young (4) of DeMatha goes up for a layup during a WCAC Boy's Semi-Final tournament game between St. John's and DeMatha held at Bender Arena in Washington, DC. (Michael R. Smith/The Prince George's Sentinel). 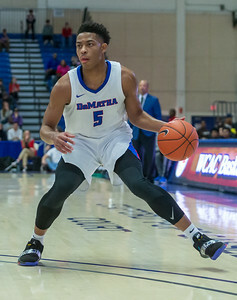 Washington, DC, Sunday, February 24, 2019: Justin Moore (5) of DeMatha during a WCAC Boy's Semi-Final tournament game between St. John's and DeMatha held at Bender Arena in Washington, DC. (Michael R. Smith/The Prince George's Sentinel). 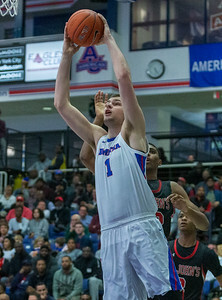 Washington, DC, Sunday, February 24, 2019: Hunter Dickinson (1) of DeMatha in action during a WCAC Boy's Semi-Final tournament game between St. John's and DeMatha held at Bender Arena in Washington, DC. (Michael R. Smith/The Prince George's Sentinel). 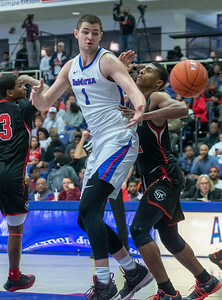 Washington, DC, Sunday, February 24, 2019: Hunter Dickinson (1) of DeMatha loses the ball out of bounds during a WCAC Boy's Semi-Final tournament game between St. John's and DeMatha held at Bender Arena in Washington, DC. (Michael R. Smith/The Prince George's Sentinel). 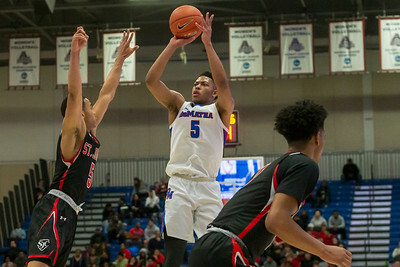 Washington, DC, Sunday, February 24, 2019: Justin Moore (5) of DeMatha shoots a contested shot during a WCAC Boy's Semi-Final tournament game between St. John's and DeMatha held at Bender Arena in Washington, DC. (Michael R. Smith/The Prince George's Sentinel). 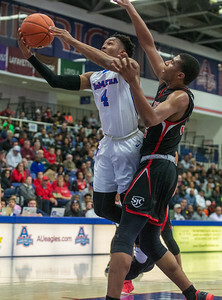 Washington, DC, Sunday, February 24, 2019: Jamir Young (4) splits two St. John's defenders during a WCAC Boy's Semi-Final tournament game between St. John's and DeMatha held at Bender Arena in Washington, DC. (Michael R. Smith/The Prince George's Sentinel).